Sunbathing on the lookout tower built in 1280. 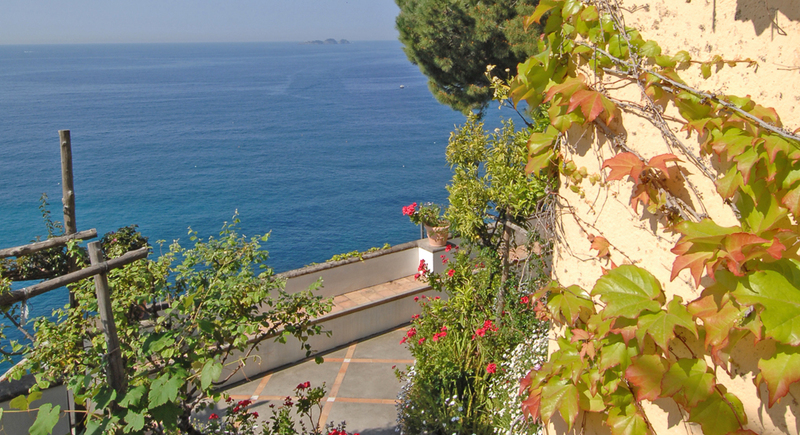 The Italian coast from Sicily to Tuscany is necklaced with such towers. 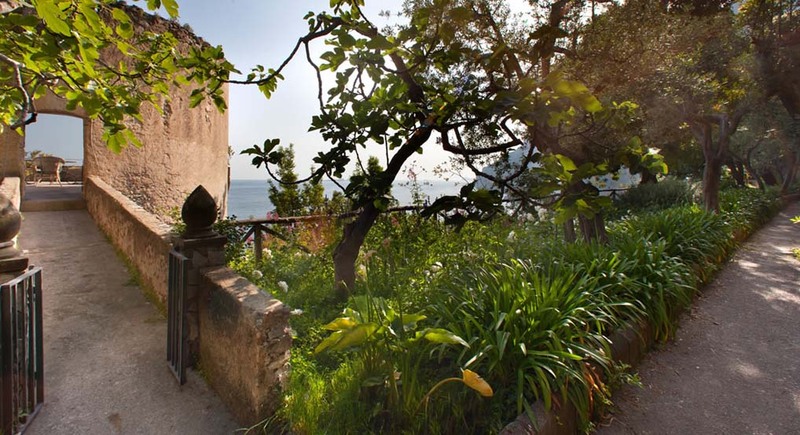 Located in Positano - the most picturesque village of the Amalfi coast - within a private gated property, this newly restored apartment comfortably sleeps 2 and has the privilege a private terrace and beach. 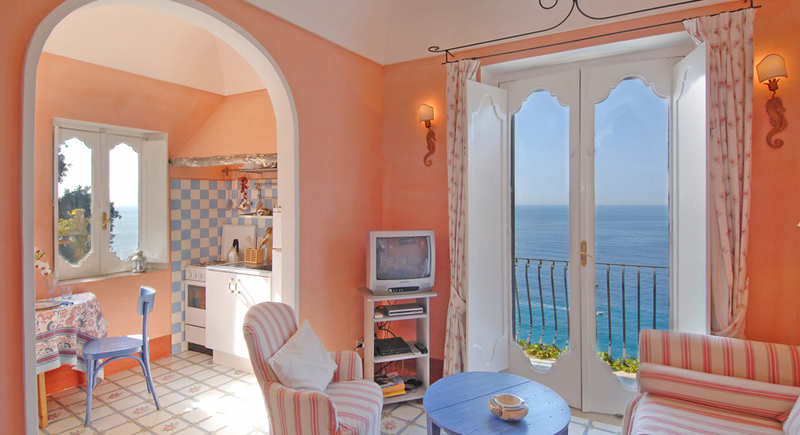 Imagine the Mediterranean sun flooding the terrace of a low white building, with light blue shutters, overlooking the sparkling Positano sea. 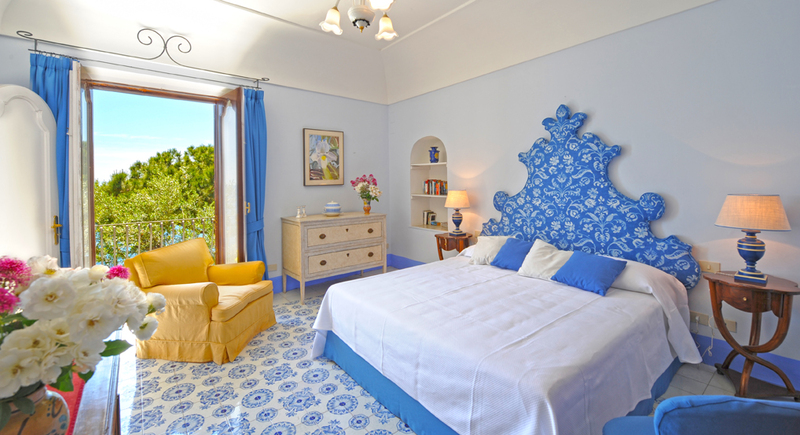 And imagine fresh interiors decorated with the typical Vietri ceramics and colored cotton prints, a sitting area with an open plan kitchen, one bedroom opening onto the terrace and its magnificent views. 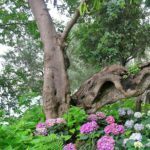 Imagine an opulent garden with olive, lemon, tangerine and pomegranate trees in an harmonious blend with more archaic species of the Amalfi Coast, such as datura stramonia, echeveria, cycas, clematis, euphorbia, hibiscus and jasmin and many others. 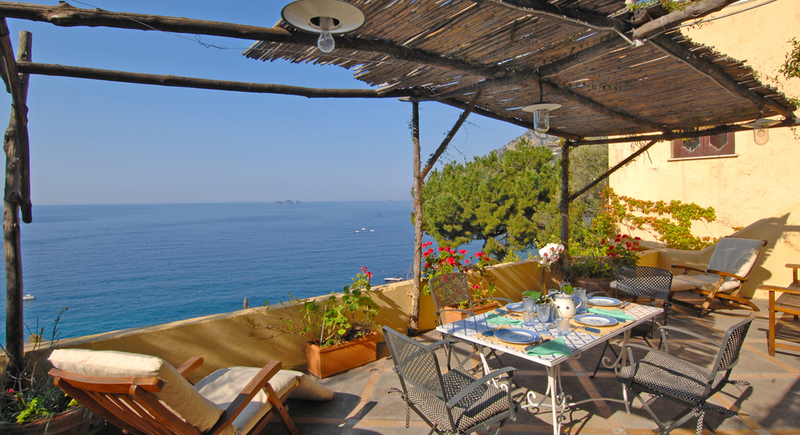 All of this is Casa piccola Acathus which is one of 5 houses available for rent within the same property, each of them completely private. 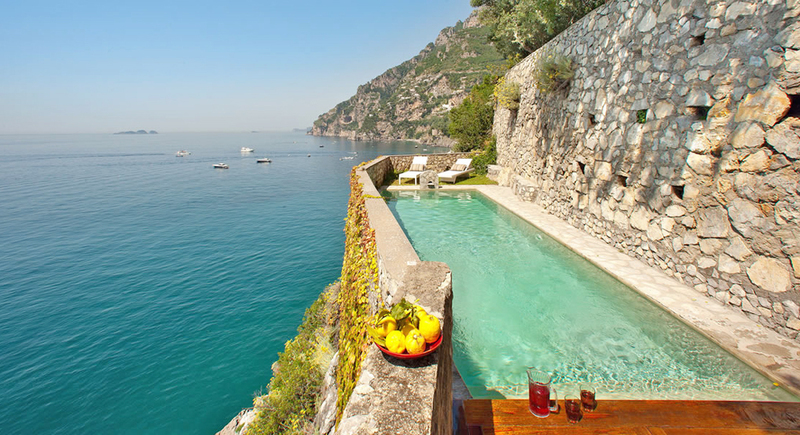 The 5 houses share a pool and a private beach reached over 200 steps. The villa belongs to two sisters. One is one of Rome's leading architects and interior designers, the other is a successful set decorator and costume designer. 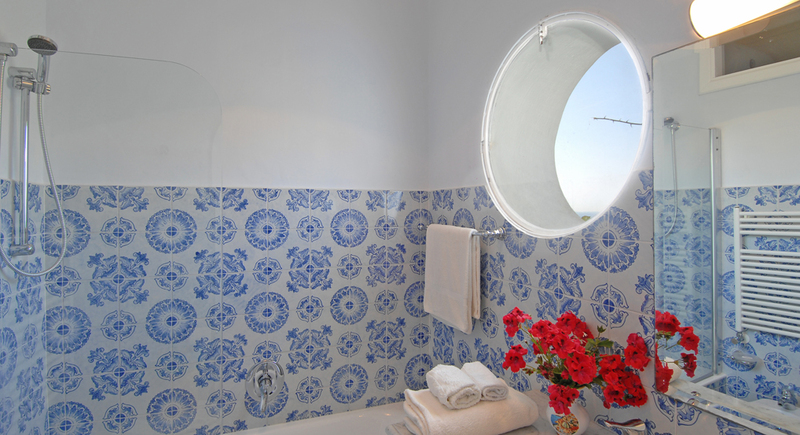 Their talents are reflected in the style of the interiors and the care given to all details. 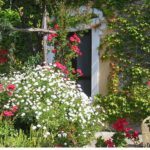 • The flower garden is planted with agapanthus, teucrium, nasturcium, plumbago, lobelia and lavender. The delicious herb garden boasts various varieties of basil, parsley, sage, oregano, mint rosemary and other pungent herbs. 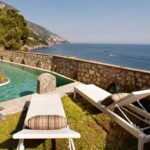 • The oxygen treated pool (therefore no chlorine), shared with 4 smaller villas located in the same compound, is placed in a magnificent spot with an unsurpassed view overlooking the Positano bay with an olive tree for afternoon shade. 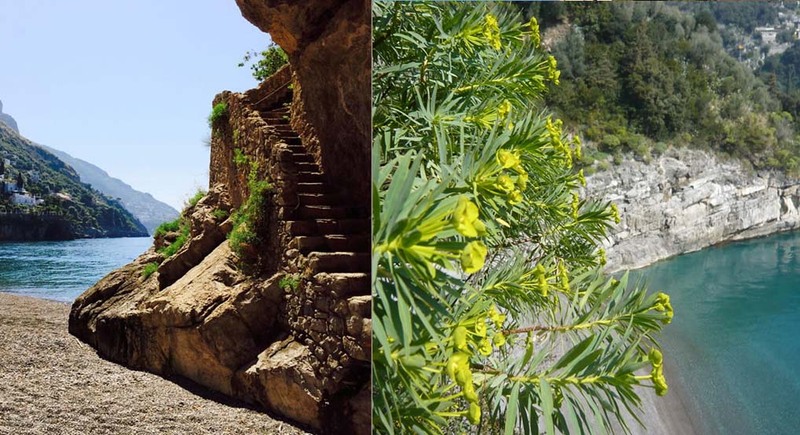 • The small beach, accessible only by the houses on the property or by boat, is reached over approx. 200 steps. The are no facilities on the beach. Just sand and water. 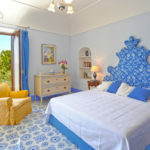 • The villa is serviced by a friendly and attentive staff who come in two times a week. More service is available on request. 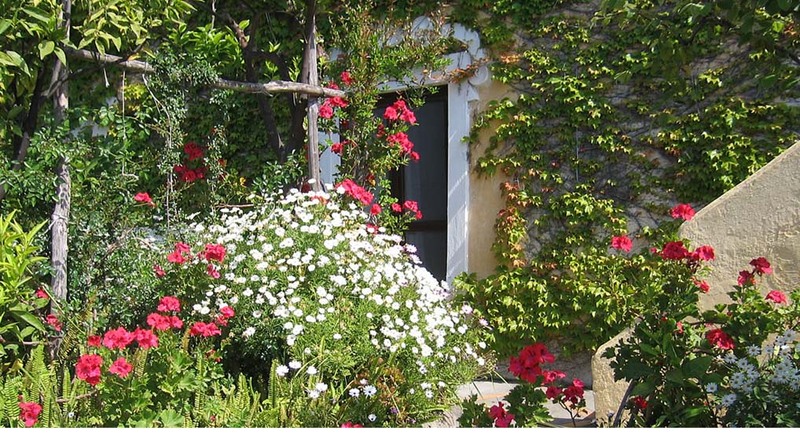 • Air-con throughout the villa included in the rent. The house also has central heating. 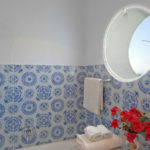 • Rooms and bathrooms have complete sets of linen, hairdryers, bath set with soap, shampoo and shower gel. • Maid service two hours, twice a week. 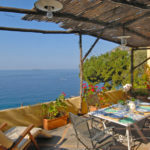 •	In the late 1940's John Steinbeck visited Positano and became a life long devotee and launched Positano into the International Jet Set with Jackie Kennedy among others visiting and this popularity has not abated as today movie stars and the wealthy of the world also come to vacation as well magnates of the DotCom society and their yachts. 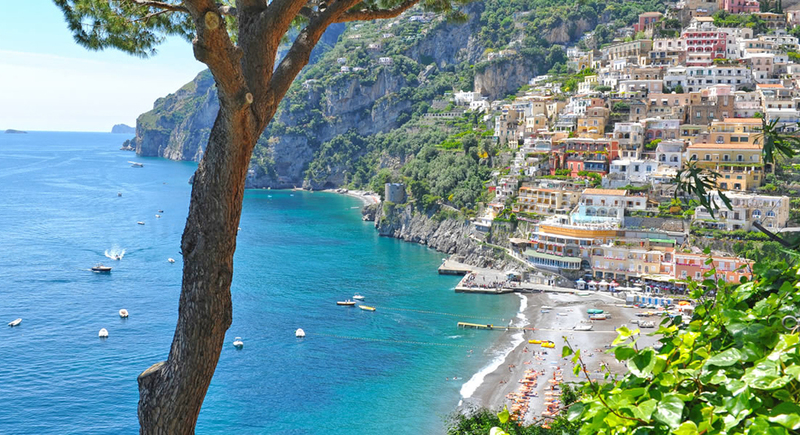 The charm and attraction of Positano seems limitless and eternal to all who have come to visit and an unforgettable experience for all visitors. Gaze in admiration at the white- and pastel-colored houses that smatter the hillside, and perhaps take a stroll along its perfectly groomed beaches. 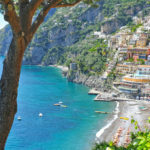 Positano has also become world famous for beach fashions of brightly coloured robes, bikinis, bags and wraps all made in cool linen or cotton. 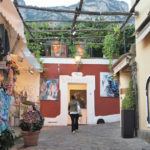 Positano is also filled with master cobblers, indeed, this is the place where to abandon your shoes and replace them with a pair of hand crafted sandals, made to measure while you wait. 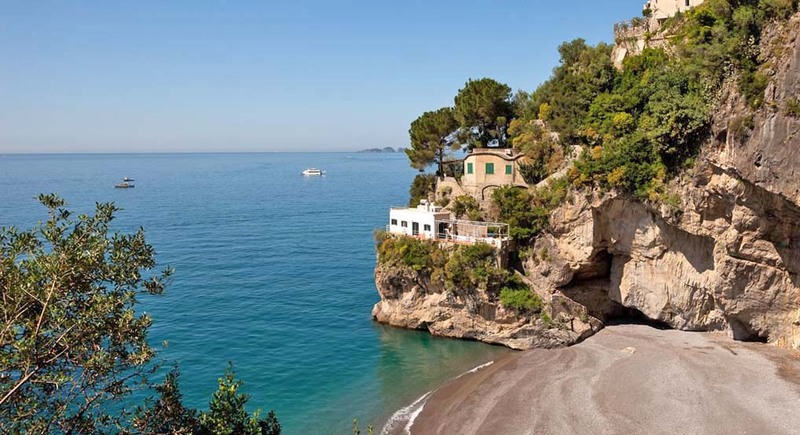 •	Not far from Positano, in the village of Praiano, spend an evening at l’Africana, an extraordinary club with cave setting, complete with natural blowholes and a glass dance floor so you can see confused looking fish swimming under your feet. Africana has been going since the '50s, when Jackie Kennedy was just one of the famous VIP guests. 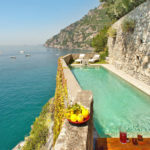 •	Ravello is a refined, polished town boasting impeccable bohemian credentials – Wagner, DH Lawrence and Virginia Woolf all spent time here – it’s today known for its ravishing gardens and stupendous views, the best in the world according to former resident Gore Vidal, and certainly the best on the coast. On Tuesday morning there’s a lively street market in Piazza Duomo, where you’ll find wine, mozzarella and olive oil, as well as discounted designer clothes. 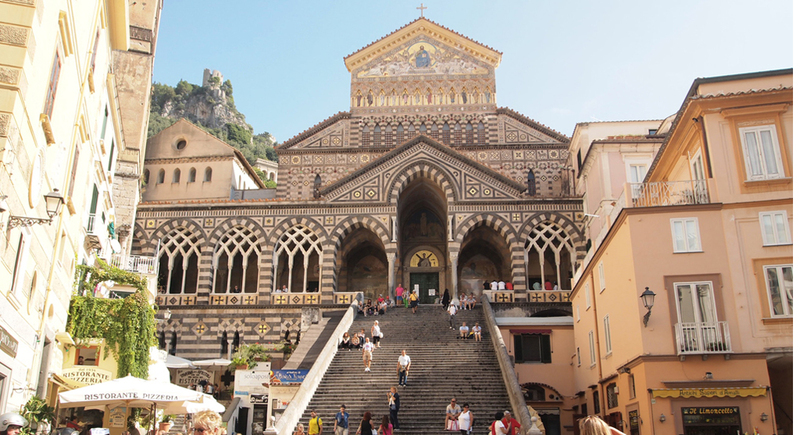 •	Picture-perfect town of Amalfi. 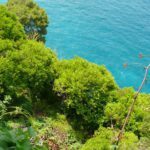 Once a major naval power, the town is now known for its stunning coastal scenery; it clings to a jagged rock face looking down over the turquoise Tyrrhenian Sea. 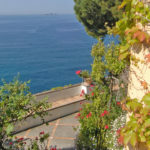 Enjoy free time here to stretch your legs on a walk around, admiring the town’s typically Mediterranean architecture, where houses seem to be built on top of each other as they straddle the hillside! 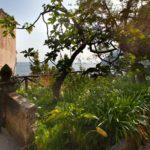 Rest in one of the cafés and sample a shot of limoncello , or perhaps check out the Cloister of Paradise (Chiostro del Paradiso) -- an intriguing Arabian-style hamlet. 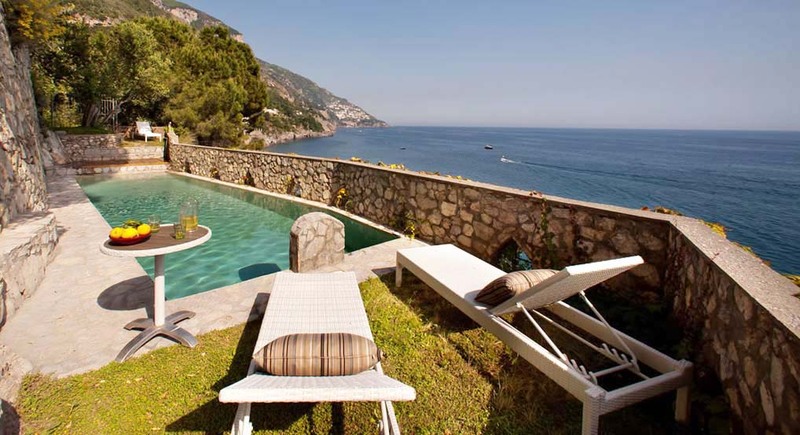 •	Try the nearby two Michelin's stars restaurant Don Alfonso in Sant’Agata sui due Golfi. This restaurant is generally regarded as one of Italy’s finest. Dishes are prepared with products from the chef’s own 6-hectare farm. The dining hall is a picture of refined taste, and the international wine list is one of the country’s most extensive and best. The menu changes seasonally, but hallmark dishes include lightly seared tuna in red-pepper sauce and pasta with clams and courgettes. •	All the colors of the Amalfi Coast, the sea’s deep deep blue, the striking green forests and the golden orange of the citrus groves seem to meet up in Vietri, particularly in the glazes and decorations of this gorgeous Campanian town’s beautiful ceramics, produced since 1600. 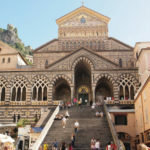 Named as UNESCO World Heritage in 1997, along with the rest of the Amalfi Coast, this community not far from Salerno was struck on a splendid site amidst hills and sea. 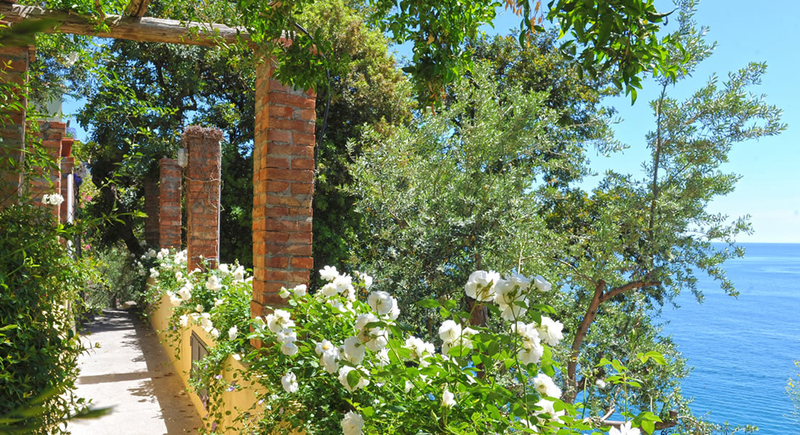 Already inhabited in Antiquity, when it was the city of Marcina, Vietri, in addition to its enchanting coastline, is surrounded by magnificent Mediterranean vegetation. 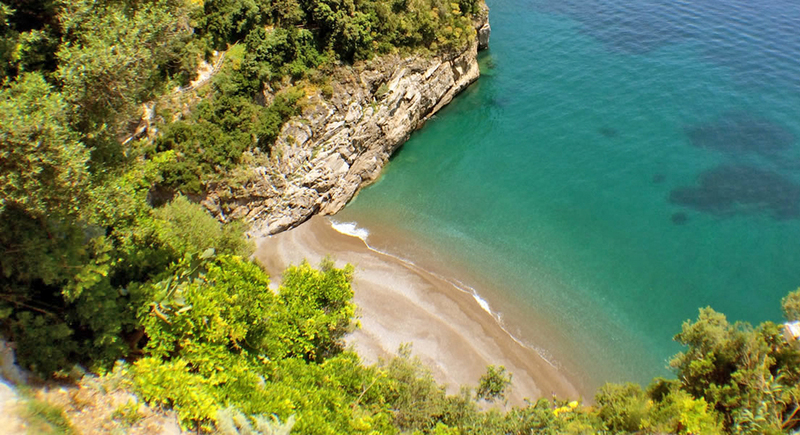 •	Visit the romantic town of Sorrento plenty of fine old shops selling ceramics, lacework and intarsio (marquetry items) – famously produced here. 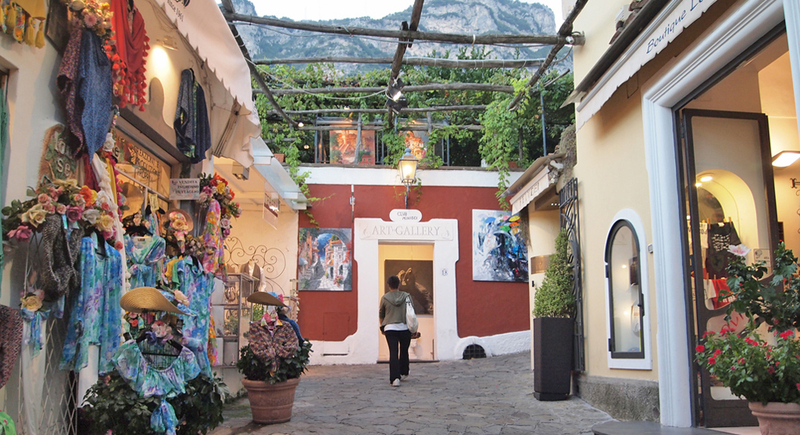 Sorrento makes a good base for catching the ferry to magic Capri island . 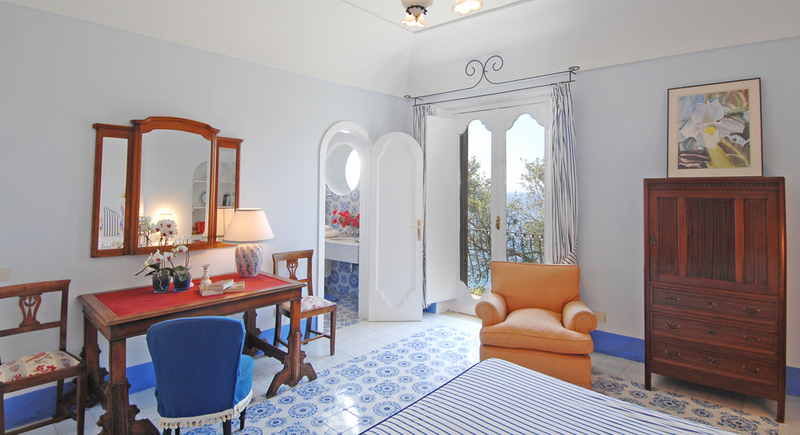 •	A legendary idyll: Capri's beguiling combination of fabled beauty and hedonism has charmed Roman emperors, Russian revolutionaries and showbiz stars for decades. It’s the perfect microcosm of Mediterranean appeal – a smooth cocktail of chichi piazzas and cool cafes, Roman ruins and rugged seascapes. 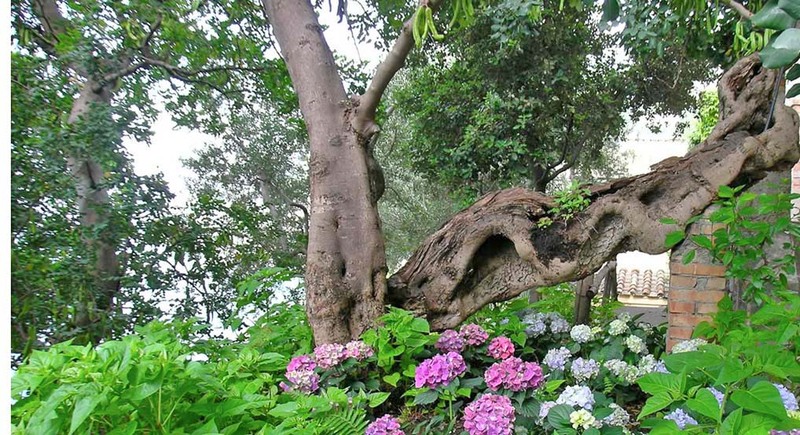 Already inhabited in the Palaeolithic period, Capri was briefly occupied by the Greeks before the Emperor Augustus made it his private playground and Tiberius retired here in AD 27. Its modern incarnation as a tourist centre dates from the early 20th century. It’s also a hugely popular day-trip destination and a summer favourite of holidaying VIPs. 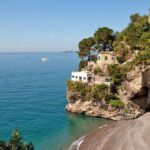 Inevitably, the two main centres, Capri Town and its uphill rival Anacapri, are almost entirely given over to tourism with the high prices that predictably follow. 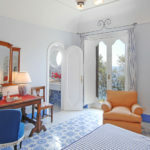 But explore beyond the effortlessly cool cafes and designer boutiques, and you’ll find that Capri retains an unspoiled charm, with grand villas, overgrown vegetable plots, sun-bleached peeling stucco and banks of brilliantly coloured bougainvillea. 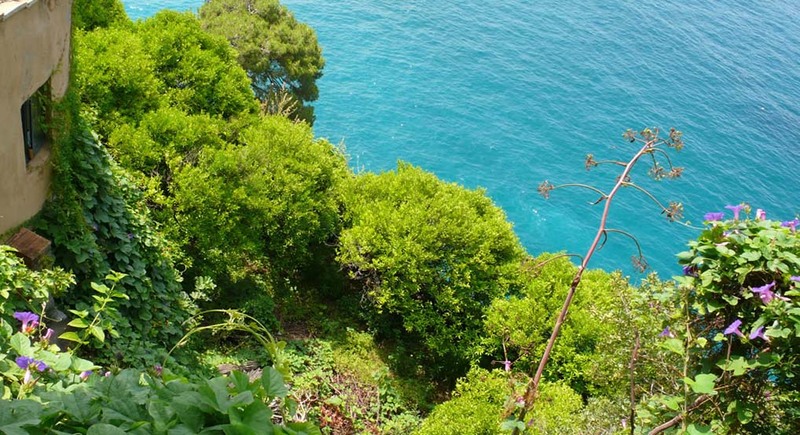 All of this overlooks the deep blue water that laps unseen into secluded coves and mysterious grottoes. 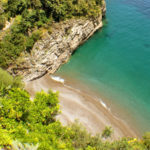 •	Head inland toward the UNESCO World Heritage Site of Pompeii -- the world-famous ancient village that lay buried under layers of volcanic ash for centuries. 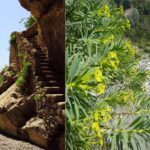 Explore the area and discover the site’s history from AD 79 when Mount Vesuvius erupted, to the early 18th century when it was ‘discovered.